Leave it to Reddit users to unearth quite possibly the most hilarious, most awesome photo of the summer. 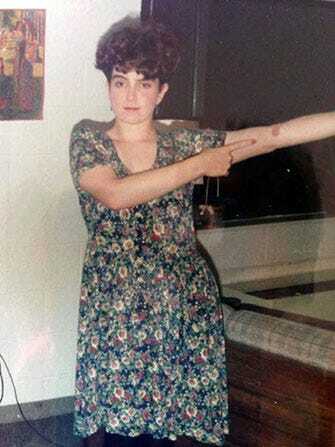 Over the weekend, this snap of Tina Fey surfaced on the networking site with almost no explanation whatsoever. But, when a picture is this good, words will hardly do it justice. The photo, which was reportedly taken during the comedian's college years, went viral on Reddit almost immediately. It appears to portray Fey showing off a fresh injury (a shot, perhaps? ), while she models what is probably the most '80s-tastic ensemble of all time. The curly bouffant! The wild eyebrows! The dress that could have been cut from the same material as her grandmother's sofa!